I'm apt to cherry pick subjects [as opposed to doing 'mass mailings'] to send to for a request to sign an item of mine through the mail - I don't send as much as I think I should be sending out because I've gotten lazy over the years and it is annoying how postage rates go up every couple of years. Through the mail autograph requests are not an exact science - sometimes you get smudged, streaked autographs because of how the autographed item was placed back in your SASE [self-addressed stamped envelope]. Also, I don't worry about it too much but some subjects [like baseball players] wait until their 'fan mail' has piled up before answering it all - usually towards the end of their respective seasons and/or their off-seasons. I sent out a small batch of requests to be mailed - most are spring training requests except for 2008 Olympians Shawn Johnson [gymnast] and Cat Osterman [softball]. I'll probably mail out more requests when I back from spring training - I figure I'll send more out when I see who has signed or who hasn't signed. I got around to seeing A-Rod's press conference later in the day - apparently there is a 'phantom' cousin who introduced him to some stuff. Only they knew about it and conspired to experiment on their own, for a prolonged period of time [2001-2003]. I don't think anybody missed much if they didn't see A-Rod's press conference on Tuesday - I honestly think he is telling us to read between the lines and make up our own minds. That maybe even more dangerous to the perception of his damaged legacy, but the fact it has come to this point should be something of a revelation. People want him to be implicate others, name substances he took and say he shot himself with all sorts of cringe-worthy stuff. He has told us what he taken, but we are resigned to the fact he is not going to get himself into more hot water and he can only go so far - he shouldn't be so naive to think, 'I'm young and I was stupid' is going to cut it with those who have an interest as fans of the game or someone who looked at him to endorse a product. 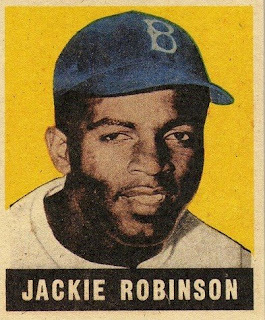 With all this fuss about A-Rod, I've come to the realization baseball may get tedious and boring as far as the day-to-day things going on in a game played in 30 cities, 162 games a year - but it is still the pasttime of guys who can identify with strong, valiant icons of the past. Baseball fans can rattle off the legends/icons associated with history of the game - whether they saw them play or not. The game has its faults, but its foundation isn't strife with 'thugs' and 'black eyes' but stoic pioneers [like Jackie Robinson] who played the game right and with integrity - baseball is built upon its history and people are always looking to size up any modern marvel and judge whether an iconic modern player of today passes muster with the likes Babe Ruth or Ted Williams. If someone like Barry Bonds or A-Rod comes along - there is a self-fulfilling prophecy to tear down and dissect their numbers because it just doesn't add up, when there can be no player as great as Ruth or Williams. There probably is a sentiment of 'I told ya' running around - in a way the icons of the past are validated for their accomplishments once again as the true torch bearers of the game. I was lurking around on Ebay and saw this card - I'm not going to say this type of card is hard to find, but I figured it was worth picking up for the price of a blaster box of 2009 Upper Deck. I might not get to see all the new 2009 Upper Deck base/parallel/cheap insert cards I would have pulled from a blaster - but it is always nice to have a nice, looking insert of a prominent player from my hometown team in-hand as opposed to flipping through cards you'll see soon enough in healthy quantities. Lackey is a franchise star and the 'bulldog' ace of the Los Angeles Angels of Anaheim - even though he is more of a national semistar. I always need to get particular players' on particular cards or just in general - even though you know you aren't seeing a potential contender in a team like the Padres, but a clustermuck of players [from Jake Peavy to Adrian Gonzalez to Edgar Gonzalez to David Eckstein to Chris Young to Cliff Floyd to Brian Giles, et al] lucky to sniff some respectibility. The Mariners may not be one of the better teams to see in spring training - if Ichiro and Kenji Johjima are already with Team Japan by next week or so. One person/player's autograph I'd like to get [a name to look for] - John Wetteland [bullpen coach]; Wetteland was a bullpen star through the 1990s and closed out the 1996 World Series. Player featured [I'd like to get his autograph too] - Franklin Gutierrez, pictured as a Cleveland Indians' player on his 2008 Upper Deck First Edition card. Is that Grady Sizemore behind him, with the eye black? The Athletics are an intriguing organization and I'll be looking forward to hunting these guys down for autographs - including established Major Leaguers like Matt Holliday and Jason Giambi. The organization has a lot of pitching talent [Trevor Cahill, Brett Anderson, James Simmons, Vin Mazzaro, Gio Gonzalez, Brett Hunter, Henry Rodriguez] - who may or may not eventually turn into Major League quality arms. For the most part, the A's offer pretty good access to players at their facility at Papago Park - particularly as workouts wind down for the morning. A possible 'special guest instructor' visiting camp maybe Rickey Henderson - so it might be a treat [literally, figuratively and maybe sarcastically] to possibly see him in about a week or so and try to get his scribble. The Los Angeles Dodgers are likely the most popular team to see in the Cactus League in 2009 - they have a new facility, which long-time Dodgers fans might not like just because they have left their Dodgertown in Vero Beach for good, but being in Arizona puts the team in relative close proximity to the rabid West Coast fan base, wanting to see their Dodgers warm up before the season starts. One person/player's autograph I'd like to get [a name to look for] - Sandy Koufax; I've heard he is reclusive, but I'm betting he'll show up at some point during spring training to visit with the organization and maybe sign some autographs for fans. I'm not banking on it, but if I'm lucky enough to see him and 'win the battle' to get an autograph, then I'll consider my trip a success. You make up a list and follow your favorite players by collecting their cards because you like watching them play - or they present a particular image you can identify with in some way. However why chase after someone's cards when you feel like if they appear unreasonable or merely unaccessible? I was on the Alex Rodriguez bandwagon because he is either the best and most identifiable baseball player in Major League Baseball or at least he is 1A to a guy in St. Louis named Albert Pujols - I found it disappointing for A-Rod to become the most prominent face of the Steroid Era in baseball when he was outed with his positive steroids test. I was eager to see if he would react by admitting fault or taking the road to denial - he ended up taking the initiative and apologized during an interview with Peter Gammons of ESPN. However, what was surprising is he established a definite time period of his use [2001-03] and if he really couldn't be any more clear about what he took for whatever reason - he did admit to taking PEDS. Come to think of it, as a guy on the A-Rod bandwagon, I didn't know what to make of his Texas Rangers' years after signing a $252 million contract - he was supposed to be the man down there, but even as he juiced up and put up monster numbers, his teams went nowhere. It was kind of a joke as far as being the best baseball player in the world playing on some garbage teams that weren't able to win. If we are to believe A-Rod's word, his PED use in 2001-03 really is the nail in the coffin to invalidate whatever he did as a Texas Rangers' player. *Being a scumbag for ogling and showing an unhealthy obsession for Canseco's wife. *A-Rod not being the guy who we thought he is and he may have partaken in some steroid delights. I can just laugh now because it is all true - and also kind of disappointing. All the controversy swelling up with tabloid pictures of him with strippers on the road, cheating on his wife, getting a divorce and hooking up with Madonna pissed me off because he was the face of the game - if for nothing else, at least show some class, though he was no different than a Michael Jordan or Kobe Bryant, who were no saints, but at least have bounced back from their personal problems. I thought about being petty and in my mind, leaping off the bandwagon - in recent months, things were relatively quiet and I thought it was the end of it. Maybe A-Rod's ability to hit 40 home runs and stink it up when it counts in October was something to watch again as far as drama playing out in Major League Baseball was concerned. I kind of enjoyed the drama of a guy making so much money making the game so simple, yet struggling in the key moments during the postseason. We thought Joe Torre's [with Tom Verducci] book was the start of a new controversy, but with I don't know what to say - I think people are more disappointed than angry. As much as people don't like A-Rod, he was a golden child compared to Barry Bonds. Now there will always be doubt and silent critics - no matter what A-Rod does. Here are my personal favorites - who knows if any of these guys are 'pure,' but certainly there hasn't been anyone outed for PEDs except for A-Rod, right? The Chicago Cubs will be the second most popular team in the Cactus League - with a number of all-star quality players, an angry [motivated] Milton Bradley, manager Lou Piniella, Derrek Lee, Kosuke Fukudome, Alfonso Soriano, Carlos Zambrano, et al. From what I've seen access to players at their camp is particularly tough - though I was barely able to get Lee and Fukudome after one practice in 2008. The Angels are my 'home town' team but they don't have a sterling reputation about signing autographs - Gary Matthews Jr. is picky about when, where and how many he signs. John Lackey used to be an accomodating signer four or five years ago, but at times, he is more likely to treat you like an opposing batter [if you want his autograph] unless you are one smokin' cutie. Vladimir Guerrero seem like a warm, humble and great guy with no ego and a great smile - but unless you know him personally, try to get him back in his native country of the Dominican Republic or under special circumstances - he will literally ignore any request stateside to sign autographs in-person. Kendry Morales is a 25-year old first baseman - a defector from Cuba and a high profile signing, he was sort of buried in the minors for a few years with Casey Kotchman at first base. Morales barely spent time in the Major Leagues after Kotchman was traded for Mark Teixeira in 2008. However, he finally gets an opportunity to stick with the Angels in 2009 after Teixeira bolted for the New York Yankees. 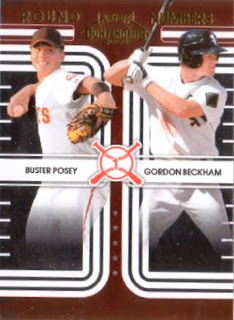 I found the Buster Posey/Gordon Beckham dual insert card - probably two of the young players in spring training I want to see up close. Spring training is a time to get autographs of various young players and every camp there are at least one or two 'phenoms' who are either destined to Major League stars or Major League busts. I'm wasn't not going to buy any 2009 Topps or Upper Deck until the hype dies down - with many bloggers busting random packs left and right to give their take, I don't want to succumb to the 'peer pressure' until the excitement over new stuff dies down a little. Despite finding nothing marked '2009' in two visits to Target - I was able go to a place where I sometimes get my cardboard fix from and cherry pick cards out of some commons bin to get my fill [instead of buying loose packs]. The prices ranged from 25 for $1, a quarter and a dime each - too bad,I was only able to find loose 2009 Topps cards and not Upper Deck. I don't see how this year's Topps is different from past years - there is a certain feeling about base Topps cards that I'm indifferent to. Maybe it is the fact after a month, every retail outlet, hobby shop, Major League Baseball team store [ones they have inside a MLB stadium or one in an MLB city] and some card show booths will be carrying these cards. For collectors, I suppose having a look at base brand Topps each year is a rite of passage. The silver on black 'name plates' makes players' names hard to read infront of the card - with 2008 Upper Deck, you can get away with it, because the full-bleed images were sharp enough to stand alone. 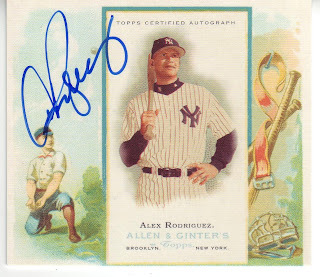 With Topps, any little design flaw is exposed as an excuse [for me] not to pick up anymore cards. However, there are some things I liked as I glanced at random cards - it seems there was a more conscious effort by Topps to include action shots [though getting some from 'different' angles like the Kevin Youkilis card is kind of distracting] as opposed to merely 'pitching, hitting and fielding' shots. 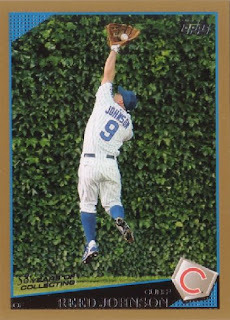 There are guys making awesome catches in the outfield [Juan Pierre, Alex Rios, Brandon Moss], flying in the air [Youkilis, Jack Wilson], directing traffic [Jose Guillen], et al. I saw the Turkey Red inserts and it mimicked the 2005/2006 Topps Turkey Red backs - as opposed to some kind of 'vanilla' Trading Card History insert style back. These cards will be a nice to find in random Topps packs. An update here and there is haphazardly made to try to keep up with the transactions while keeping track of cards I still need or already have for spring training - I'm worried a friend is picking up cards left and right [of different players, multiple quantities], leaving me behind. Perhaps I've got to focus on a little 'game planning,' so I get stuff signed - it means making do with what I have [I think I have enough] and realize it isn't a battle and there are really different priorities as far as what I need to get autographed. I was dreaming about something as I slept on the couch - I heard the faint ringing of a doorbell and knock on the door. I ran as fast as I could to the door, so I could sign for the package. All I cared about was securing what I assumed - was my redemption from Upper Deck in my hands. It looks like a bubble mailer was mailed from Upper Deck's offices in Carlsbad - I had thought everything they did was in Nevada. I was hoping to get someone infamous [maybe Richard Nixon] or someone iconic [maybe John F. Kennedy] - I'm not sure if Woodrow Wilson, the 28th United States President can be squarely pidegonholed into either category, but his cut autograph card [serial #'d 05/22]was the one that popped out of the bubble mailer, housed in nothing but a thick-card top loader. What stuck out in getting this particular certified cut autograph card is during a time when the United States has taken one step forward in having its first African-American President in Barack Obama - Wilson was probably the symbol of 'institutionalized racism' in the United States during the first part of the 20th century. Even today as the United States is more a melting pot, it gets to be a volatile one due to racial issues. Wilson's views and actions may not be at all flattering or qualities to admire his life for, but something part of his legacy as a United States President. I'll be busting 2009 Topps and 2009 Upper Deck soon enough - nice to see Upper Deck on the ball and sate my collecting impulses by fulfilling my redemption in a short time. I initially thought I'd be getting a more common cut from this list of baseball players - but then my mouth started watering when I saw this and this. It was a mystery redemption, where all I knew was I was going to receive a certified cut autograph card of a former United States President. I don't know if the redemption ended up as a 'holy crap' pull that is a collection centerpiece [anyone have a 2009 Topps Vladimir Guerrero super patch card]? - but there is definitely a lot of history behind the cut autograph and hopefully it will be in my personal collection for a long time. You can get a number of players, personnel, special assistant to the GM [former players], minor league coaches, et al during spring training - I can't worry about who I don't have cards/other items for with the number of cards/possibly other items I'm bringing during the trip. I've always believed in being concise and bringing everything for everyone, but you cannot anticipate everything. One person/player's autograph I'd like to get [a name to look for] - Trot Nixon; haven't seen him at all and I still need an 'old' 8x10 and a 2004 Topps Cracker Jack set card signed. Player featured [I'd like to get his autograph too] - Ryan Braun; maybe down to signing cards without personalizations? The Indians are back in Arizona and hopefully there will be ample access to get autographs - I need to knock out many cards from all the teams, but the key is rubbing all my cards down [the glossy ones], so when the cards are signed, they come out clean. There is no time other than now, to make sure the surface of my cards are otherwise ready-to-get signed. One person/player's autograph to get [a priority] - Grady Sizemore of course. 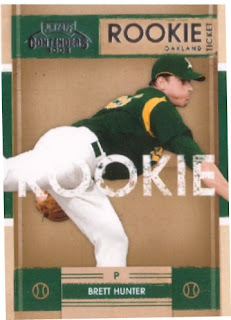 One person/player's autograph I'd like to get [a name to look for] - Carl Pavano; haven't seen him at all and I still need an 'old' 2001 Fleer Tradition set card signed. Texas Rangers camp in Surprise figures to be busy - Josh Hamilton is a superstar now, legend Nolan Ryan is intent on putting his stamp in the organization and there will be hot prospects like Elvis Andrus, Justin Smoak and Neftali Feliz in big league camp. I've been to the Cactus League in Arizona for the last several years and this will be a fun little preview for me to do on the teams that will be there in a few weeks - it seems like Arizona is the place to be once pitchers and catchers start reporting and I'll be taking a trip with a friend and his acquaintance for about 10 days.